Jeffrey: Why hush-hush relocation? | Daily Express Online, Sabah, Malaysia. 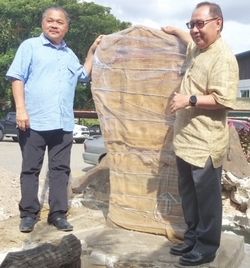 Keningau: Keningau Member of Parliament, Datuk Dr Jeffrey Kitingan, questioned why the historic Batu Sumpah (Oath Stone) is being relocated quietly without informing the leaders in the area.He said the Batu Sumpah is a National Heritage and belongs to the public and that it should not be politicised. "All leaders regardless of political ideology and background should be invited to attend the relocation ceremony from the Keningau Secretariat to a new location near the Heritage Museum on Sunday. "Political issues need to be set aside because all leaders, including the people, have the same rights in the Batu Sumpah," he said after visiting it at the Keningau Secretariat and the new relocation site, Friday. Dr Jeffrey said the key words (Kerajaan Malaysia Jamin/ Malaysian Government Guarantees) must also be the same as in the original. "If the original is stored in the museum, the new plaque as replacement should be the same as the original. "The current (replacement) plaque at the Batu Sumpah is incorrect and should not be used anymore". Asked if he would be present that day, he said: "We are not going because we were not invited, including as a People's Representative for this area. "If invited we attend. Huguan Siou Tan Sri Joseph Pairin Kitingan, as head of the KDM community in the state, should also be invited as Pairin is also the President of the KadazanDusunMurut Cultural Association (KDCA) Sabah," he said. He said he only knew about the relocation in social media. "I saw the photo of the Deputy Chief Minister who is also the Minister of Tourism Culture and Environment, Christina Liew, in the banner and asked her whether political leaders were invited. "She said she did not know who the organisers were and is unable to attend," he said, adding if it were to be relocated it is necessary to follow Kadazan Dusun Murut (KDM) customs and culture as when it was initially erected on Aug. 31, 1964 because it is the most important monument in Malaysian history. Sensing that the interior natives were still against the formation despite almost a year after independence through Malaysia, the British Government was informed about the need to placate the natives. Approval was then given by Whitehall to the first State Cabinet of Donald Stephens to find out what would convince them. Stephens despatched Richard Lind (now Tan Sri and at that time Resident of Keningau) who said the natives wanted the assurances of the Federal Government cast in stone instead of on paper, including the key words "Kerajaan Malaysia Jamin". Hence, according to Jeffrey, without this (Batu Sumpah) the indigenous people in Sabah's interior would never have accepted the formation of Malaysia. "So the Batu Sumpah cannot be politicised if it wants to be relocated, involve all communities, political leaders including opposition and not only government leaders. Dr Jeffrey who is also Tambunan Assemblyman, said: "I ask that the Batu Sumpah Relocation Committee be required to perform in general by involving all indigenous people throughout Sabah and not Keningau alone. "These include political party leaders wherever they are and then we respect this for relocate as it involves history, involving Malaysia's agreement, involving custom and also involving public order."